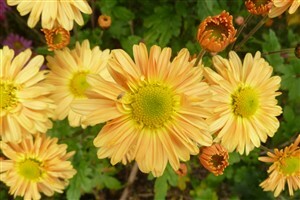 Chrysanthemum 'Slapanicka Vladenka' (3'). A very rare variety recently introduced from Prague botanic gardens by Judy Barker (thanks Judy) with large semi-double soft salmon coloured flowers and a lime eye aging to yelow. Excellent in Oct and Nov, for sun, reasonaby well drained.